We are within walking distance from the Freedom Tower & 9/11 Memorial, The Oculus and the Ferry to the Statue of Liberty. Find Directions below. Walk west along Battery Place. From Rector Street, walk south down Greenwich Street toward Battery Park; make a right on Battery Place and continue walking west. From Whitehall, walk west along Battery Place. From Rector Street, walk south down Greenwich Street toward Battery Park; make a right on Battery Place and continue walking west. 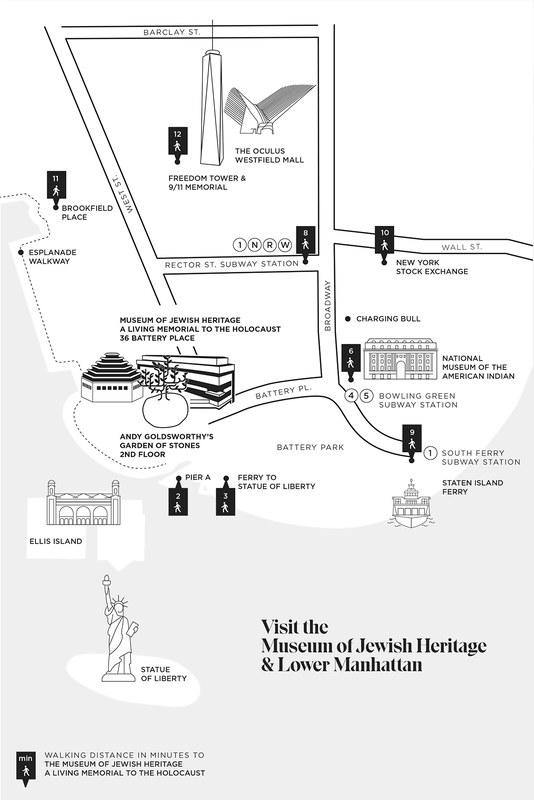 This free bus service connects Battery Park City with the South Street Seaport, making stops at many important destinations from river to river—including a stop right in front of the Museum. Service is provided seven days a week in 10-minute intervals from 10am – 7:30pm. Taxis are available on Battery Place or in front of the Ritz-Carlton Hotel (located directly across the street from the Museum). A Citi Bike station is located one block away, at the intersection of West Street and 1st Place. Staten Island Ferry to South Ferry Terminal. Take FDR Drive to the Battery Park City/Staten Island Ferry (Exit 1) and follow the signs to Battery Park. At the intersection of State Street, Battery Place, and Broadway, turn left on to Battery Place. You will go through a succession of stop signs as you head straight. The Museum is on your left, just past Robert Wagner Park. The West Side Highway (also route 9A) turns into West Street. At the end of West Street, turn right onto Battery Place. The Museum is on your left, just past Robert Wagner Park. Take the Holland Tunnel to Route 9A, which turns into West Street. At the end of West Street, turn right onto Battery Place. The Museum is on your left, just past Robert Wagner Park. Discounted parking is available at four nearby garages. Present your parking ticket at coat check for discount validation.